A recipe for dashi can be as simple as water and kelp, but adding bonito makes the dashi more complex and complete. In Japanese cuisine, all roads lead back to dashi, the base stock made from dried kelp (seaweed) and dried fish. Even in a sushi class with Morimoto , he demoed the proper preparation of dashi well before he broached the topic of fish. Perusing through a Japanese cookbook, you reach the same conclusion: without dashi, most of the recipes could not be executed. Despite the importance of dashi, many cooks still aren’t sure how to make and use the stock. Cooks with traditional French training will wonder where the mirepoix and piles of bones come into play, or how it’s even possible to make a stock in under a half-an-hour. The simplicity of dashi is indeed one of its most amazing features. It really can be made in thirty minutes from start to finish and requires just two ingredients: kelp (kombu) and dried bonito (a relative of the tuna). That being said, it takes a bit of practice to know when to remove the kombu and bonito in order to extract the right amount of flavor. Plus, there’s straining involved. Any recipe that calls for a strainer can’t be entirely effortless. Thomas Keller mentions in one of his cookbooks that “if in doubt, strain.” Each day I spend in the kitchen reaffirms the truth of this pithy claim. I often find myself relying on the strainer to smooth out a puree or, in the case of dashi, strain the excess from the stock. 2. 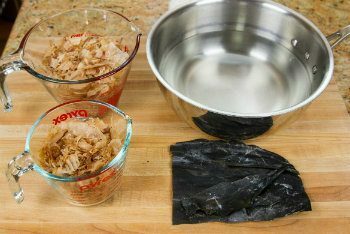 Gently clean the kombu with a damp cloth without removing the white powdery “umami” substances. Do not wash the kombu. 3. Make a couple of slits on the kombu or slice into strips. 4. Put the kombu and water in a saucepan for at least 30 minutes. If you have time, soak for 3 hours or up to half day. kombu’s flavor comes out naturally from soaking in water. If you don’t have time at all, skip this process. 5. Slowly bring to a boil over medium low heat, skimming the surface occasionally. 6. Just before boiling (you will see bubbles around the edges of the pan), remove the kombu and keep it for “Niban Dashi” (see Note). If you leave the kombu inside, the dashi will become slimy and bitter. 7. Turn off the heat to let the dashi cool down a bit. 8. Add the katsuobushi and bring it to a boil again, skimming occasionally. 9. Once the dashi is boiling, reduce the heat, simmer for just 30 seconds, and turn off the heat. 10. Let the katsuobushi sink to the bottom, about 10 minutes. 11. Strain the dashi through a sieve lined with a paper towel set over a bowl. 12.Gently twist and squeeze the paper towel to release the extra dashi into the bowl. 13. 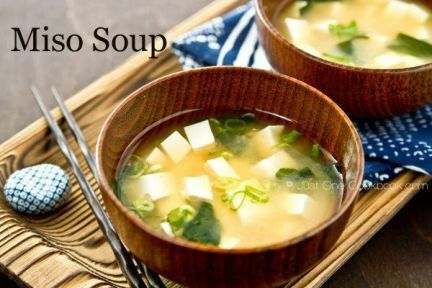 If you are not using the dashi right away, save it in a bottle and keep in the refrigerator for 3-7 days or in the freezer for 3 weeks.